Cut the tip and tail off of each acorn squash, and them length-wise. Scoop the seeds and innards out of each half. Drizzle each half with about a tablespoon of olive oil, so that all of the flesh is lightly coated. Drizzle each half with about a tablespoon (or two) of honey. Sprinkle kosher salt and cinnamon over the squash. Place the acorn squash cut-side up on a baking sheet and roast in the oven for 45 to 50 minutes or until the squash is very tender when poked with a fork. Rinse the quinoa well and soak it in a small pot for about 10 minutes. Drain the quinoa and add 1.5 cups of water to the pot. Bring the quinoa to a full boil, then reduce the heat to medium-low, cover the pot, and allow the quinoa to simmer until all of the water is absorbed, about 15 minutes. In a small bowl, whisk together the orange zest, orange juice, olive oil, cinnamon, and salt. Once the quinoa is finished cooking, transfer it to a large bowl and pour the orange dressing over it. Add the remaining ingredients and mix everything together well. 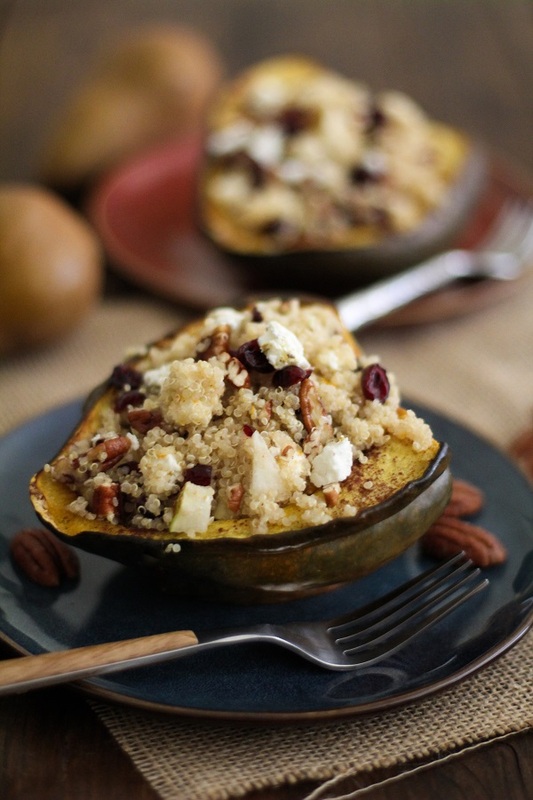 Scoop desired amount of quinoa stuffing into each acorn squash and serve! This cancer-fighting recipe was generously contributed by theroastedroot.